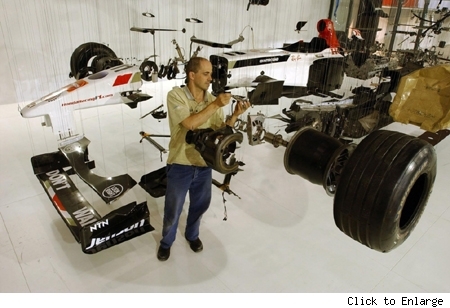 The Honda Racing F1 car is made up of 3,200 individual parts, and if you go the the British International Motor Show this week or next, you'll be able to see every single one. Literally. 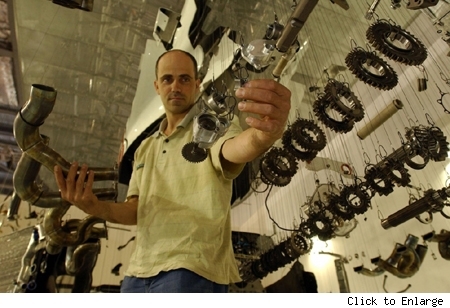 That's because Dutch artist Paul Veroude has seemingly worked magic with his exhibit called "View Suspended," in which each and every part of the car is suspended from above, creating a living exploded technical diagram. As awed as we are by the photographs of the display, we can only imagine how impressive it looks in person. Everything down to the smallest little screw is hanging in suspended animation. Manufacturers always strive to have interesting displays at autoshows, whether they be safety demonstrations, cutaways, or other imaginative ploys to generate visitor interest. With "View Suspended," it's a safe bet that Honda will be capturing the attention and imagination of every single person who walks by it. It's just that cool. Click on any photo to enlarge it. It's the best way to get a sense of the painstaking effort and incredible attention to detail that went into this piece. 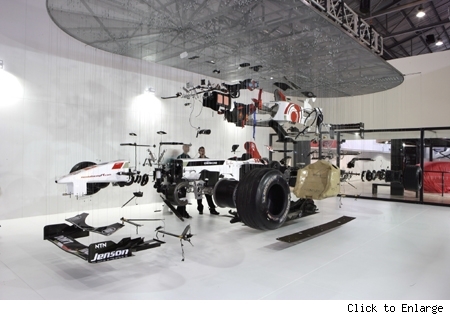 View Suspended is a stunning art installation created from the thousands of parts that make up a Honda Racing F1 car. The amazing display was created especially for the event by Dutch artist Paul Veroude. Each of the 3200 parts of the Formula 1 car are suspended on fine wires to produce a 3D 'exploded diagram' that allows race fans the chance to get closer than ever to the engineering secrets of the world's most technically-advanced sport. Honda first recognised Veroude's talents two years ago, when Artwise Curators, who develop art projects with the Honda team, came across a museum exhibition of his deconstructed vehicles. Paul then got his first opportunity to get close up and personal with a Honda Racing F1 car during a visit to Silverstone. 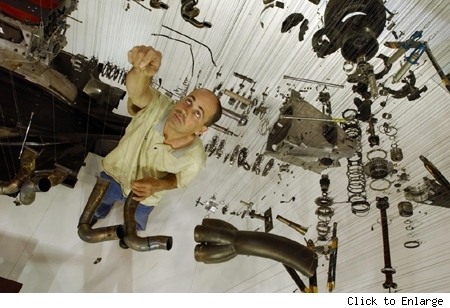 His passion for the sport and the Honda Racing F1 Team's engineering expertise catalysed a very special work of art. For Paul, the opportunity to work with a top F1 team was the realisation of a life long ambition. For the Honda Racing F1 Team, the collaboration provided a unique opportunity to share the secrets of their success with fans. Deputy Technical Director at Honda Racing, Gary Savage, took a personal interest in the project: "After meeting Paul we were keen to work with him to develop the installation and showcase our work. We know from our own experience, when we do drawings ourselves, exploded diagrams are very popular with people - you can see how things go together. This is a combination of engineering and sculpture - if you did it as a picture it would be very attractive but as a 3D thing it is even more stunning. It shows off our car in a very exciting and innovative way." Honda's Head of Car Marketing, Jeff Dodds says: "The first time we saw View Suspended, we knew it would be perfect for the London Motor Show. It's creative, imaginative and a must see for visitors to the Honda stand. I can't think of a better expression of Honda's passion for F1 and engineering."